House flies (Musca Domestica) are among the common annoying insects around the house that are often seen in great numbers during the summer. These flying pests often lay eggs in warm and moist areas such as garbage bins, animal manures, rotten vegetables and fruits, or other areas contaminated by any of these organic materials. Their larvae are composed of light colored legless grub otherwise known maggots that develop into adult flies within a period of 7days. One of the prominent features of houseflies is their sponge-like mouth--which they use as a suction when they ingest food (they eat solid food by liquefying it with their saliva). The type of mouth these houseflies have make them incapable of biting. But it doesn't mean that they are harmless. Houseflies are susceptible of carrying disease-causing bacteria and viruses due to their inclination of consuming animal and human wastes. 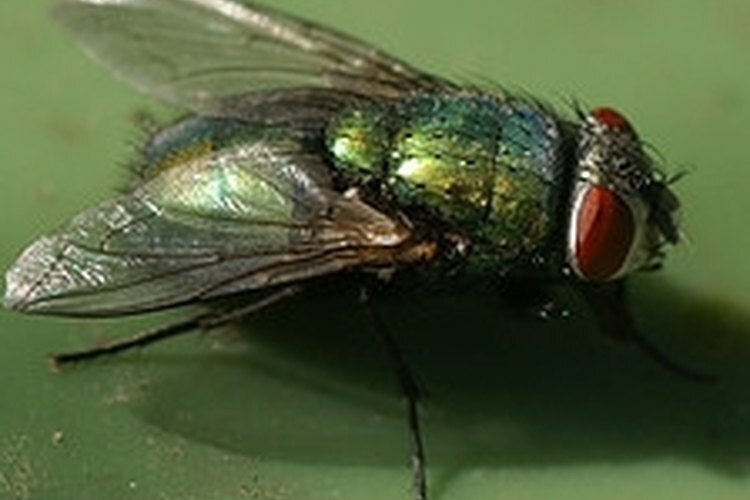 Health conditions caused by flies include diarrhea, cholera, dysentery, or salmonella. To protect your home against flies apply the following steps. Prevent flies from getting inside your home. Seal cracks around your house to where flies can possibly enter. Install some screens that fit well on your windows or doors. When your screens got holes on them, make sure to patch it up with duct tapes until you can install new ones. Cover opening underneath and on the sides of your air conditioning windows. Instruct children or anyone in the house to not open doors or windows that long to prevent flies from coming in. Observe proper sanitation outside your home. Keep your yard free from animal feces or any decaying organic matter. Do not allow trash to build up and make sure to keep it in tight sealed garbage bags and bins. Shut garbage bins all the time and sprinkle some ample amounts of borax on dumpsters to prevent flies from coming and breeding on that area. Avoid letting your trash sit near your home and try to dispose it regularly to prevent it from accumulating. Keep the inside of your house tidy. Clean any traces of food or liquid in your kitchen or anywhere in the house. Sweep off bread crumbs or fruit peels and place them in tight sealed garbage bags. Do not allow food uncovered and make sure to store left overs properly inside zip lock bags or any releasable containers. Wipe off stove tops or tables with a mixture of water and bleach to keep it free from food bits or sauces from where your cooking or eating. Also, it would help if you flush bleach on your sinks.Vacuum floors regularly and mop it with disinfectant floor cleaners to keep your surroundings sanitary and fly-free. Try using fly buster gadgets. Purchase the traditional or electric fly swatters and swat as many flies as you can; just avoid doing it near areas with food to avoid dead flies from falling on them. Sticky fly ribbons or papers and bug repellent sprays are also excellent in eliminating flies inside or outside your home. You can make your own sticky fly paper by mixing corn syrup with sugar. Mix ¼ cup of corn syrup and ½ cup of sugar in a bowl. Cut some strips of paper, spread the mixture on it with a butter knife, and position them to places where flies are often located. Use some scents that fly hate to repel them. Try hanging citrus smelling pomanders around your home; or you can also hang some branch of pines or perhaps ground cloves in small bags to drive flies away. If you like the scent of cintronella, you can spray them around the house or may be just light a cintronella candle-- flies and mosquitoes hate these stuff. Repel flies with baits and ultraviolet light. You may want to use cone traps with fly baits to eliminate flies. Fly baits on these traps are foul smelling which makes it more appealing to flies-- this is excellent for outdoor use. For indoors you can try the effective ultraviolet light or bug zappers to get rid of flies. These type of bug repellent tends to attract bugs such as flies. When attracted bugs are in contact with its grid, they will be charred from its high voltage current. Wipe flies out with plant and water. Place some potted basil plant inside your home, especially around infested areas (flies don't like this plant). Prepare a huge zip-lock bag, fill half of it with water, and hang it near doorways and porches. Water from the bag refracts lights which makes flies feel disoriented and confused as they look through it, preventing them to go inside your home. Make sure to keep insect repellents such as bug sprays and borax away from the reach of children and pets.